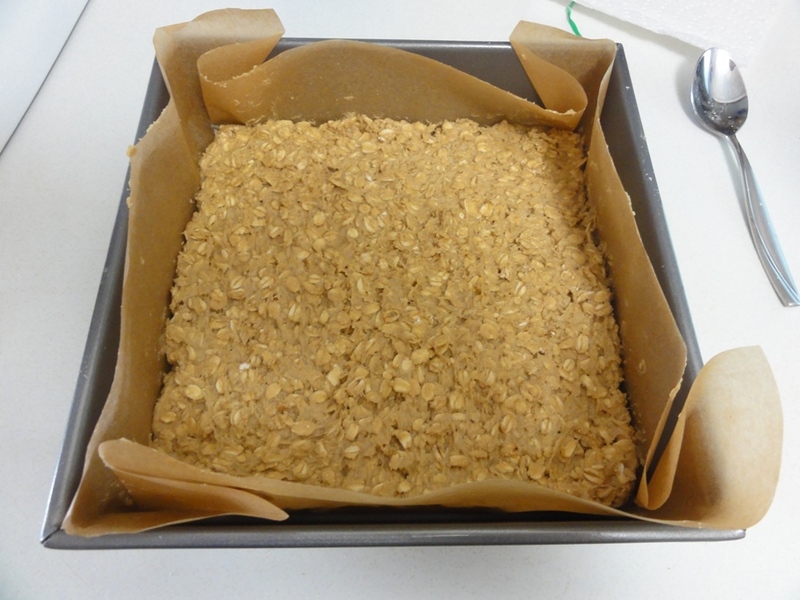 This week’s recipe comes courtesy of Kristin Rosenau and her blog “Pastry Affair“, and is only a minor modification to her Strawberry Honey Oatmeal Bars. I chose to use blueberry jam instead of strawberry simply because I happened to have the former already on hand. 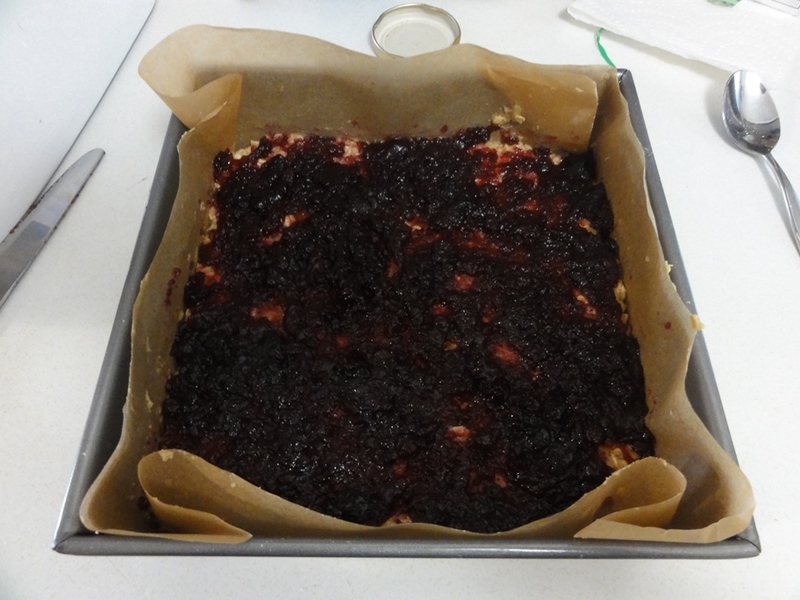 My attempt and pictures don’t come close to how amazing her Strawberry bars look, but the end product is still satisfying and delicious. 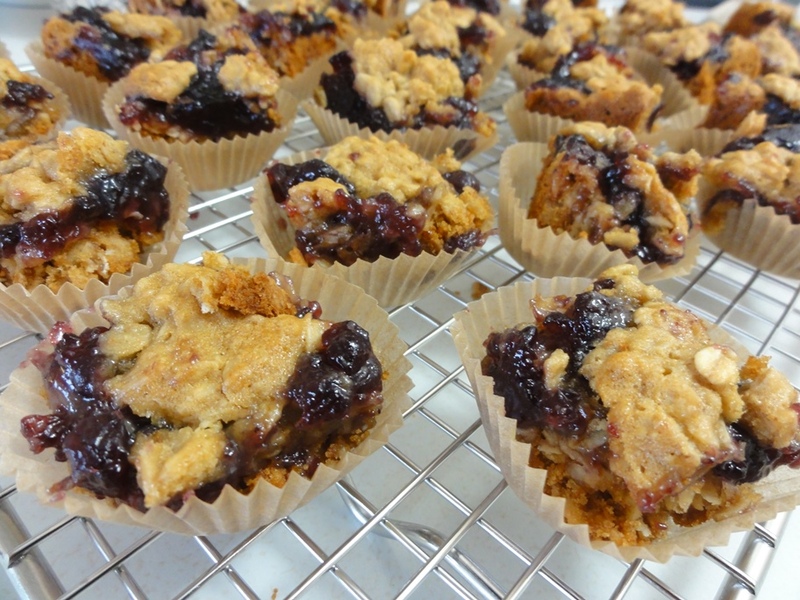 Cut 6×6 or 7×7 these squares fit conveniently into mini-muffin cups! 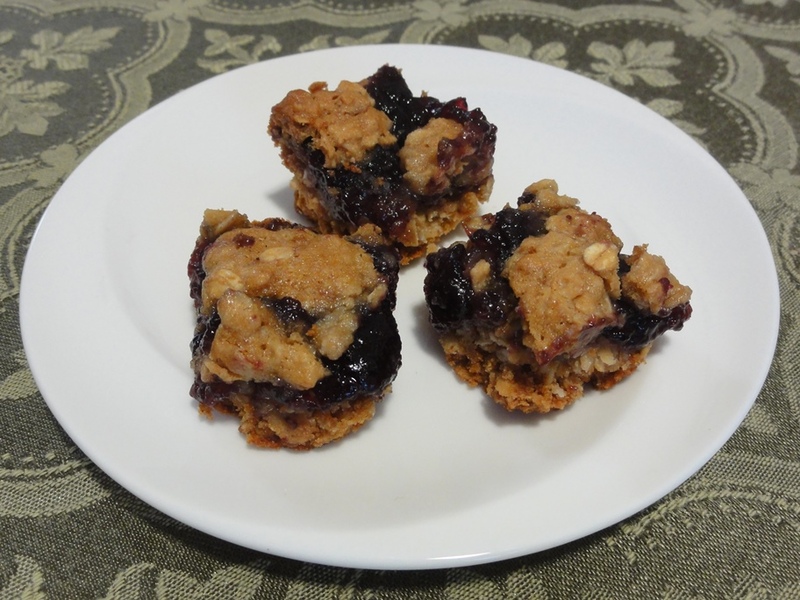 If the thought of a chewy, gooey, and a little messy combination of oats and jam appeals to you then you need to make these bars. They make for a marvelously indulgent breakfast treat and the touch of honey in each bite is a great complement to the fruitiness. 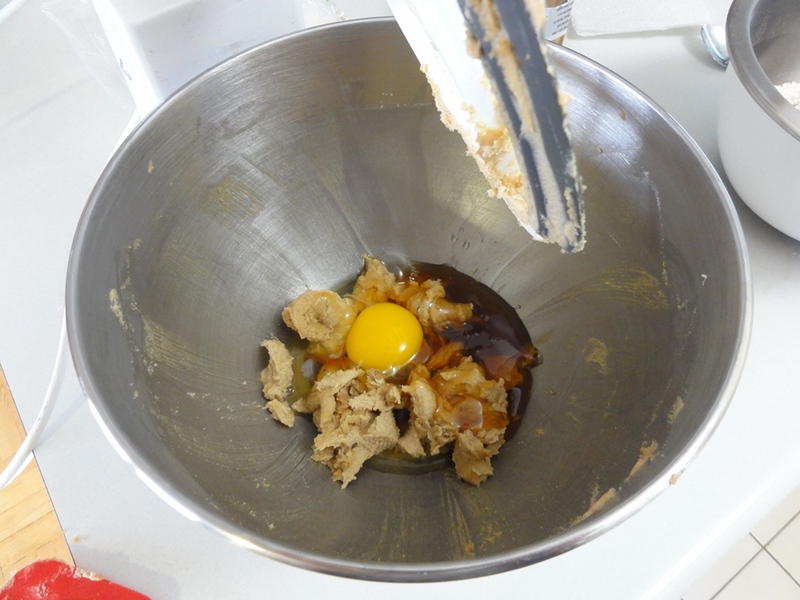 On account of the dough being somewhat sticky they are a little messy to prepare in the pan once you’ve got everything blended together, but one way to look at it is that if you don’t make a thorough mess of your kitchen you’re not doing it right. That mindset has always worked for me! 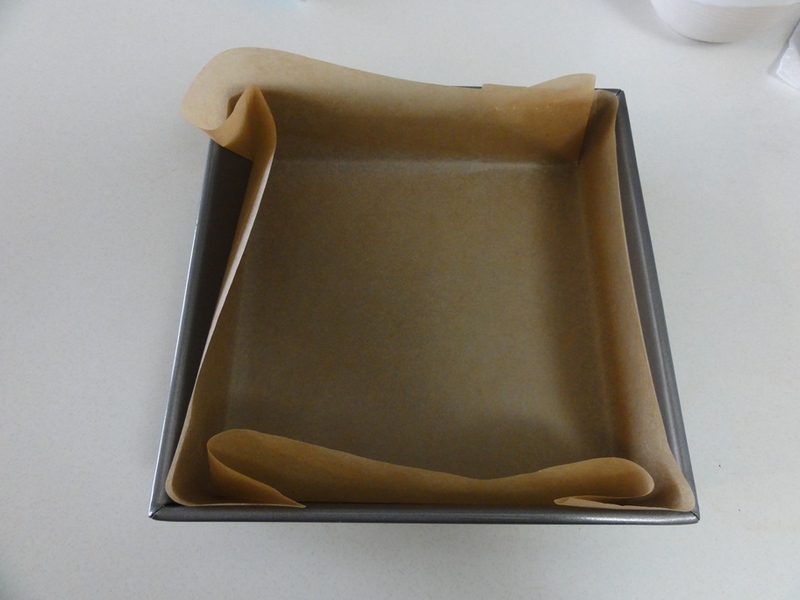 Preheat oven to 350°F and line an 8×8″ pan with parchment paper. 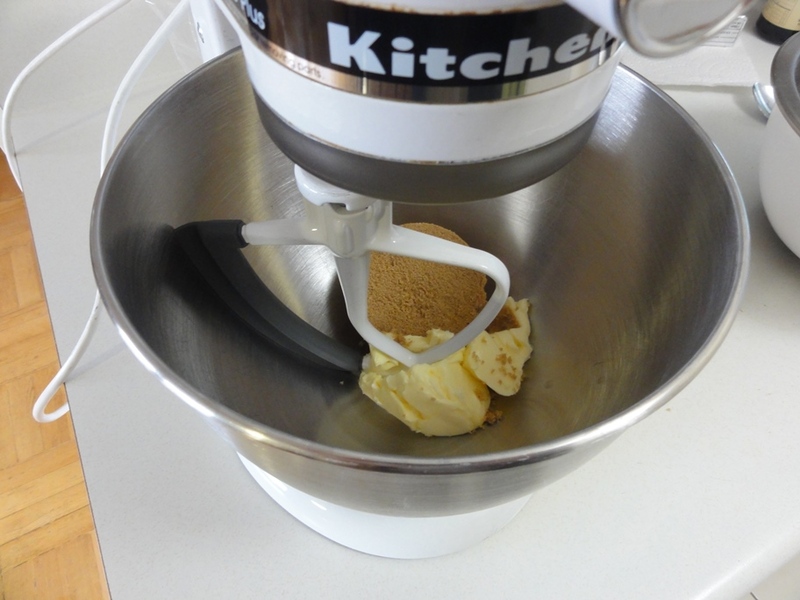 Cream the butter and sugar together until well-combined; about 2 minutes on medium speed. Beat in the egg and honey until well-combined; about a minute on medium speed. 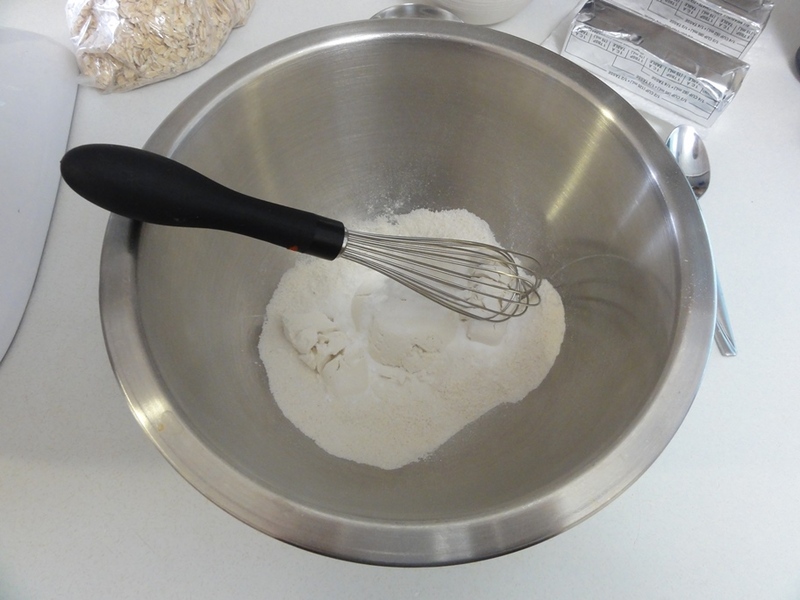 Add the flour mixture to the wet ingredients in small quantities, beating on low speed until well-combined each time. Spread 3/4 of the dough into the bottom of the pan and use either floured fingers or a spatula to evenly distribute the dough. Crumble the remaining dough over the top of the jam. Bake for 25-30 minutes until the top is golden brown. Let cool for a few minutes in the pan and then transfer to a wire rack to cool before cutting. 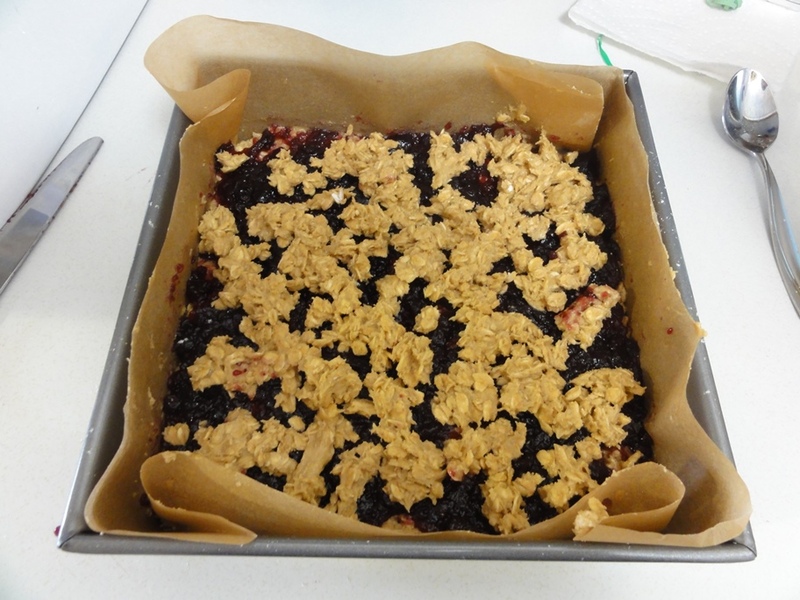 Any kind of fruit preserves or jam should work fine in these squares, giving you all sorts of possibilities in flavors. I suggest trying to find the variety that is basically just fruit, with little to no added sugar. There’s plenty of sweetness from the honey and you’d want to avoid overriding the honey flavor with a super-sweet jam. 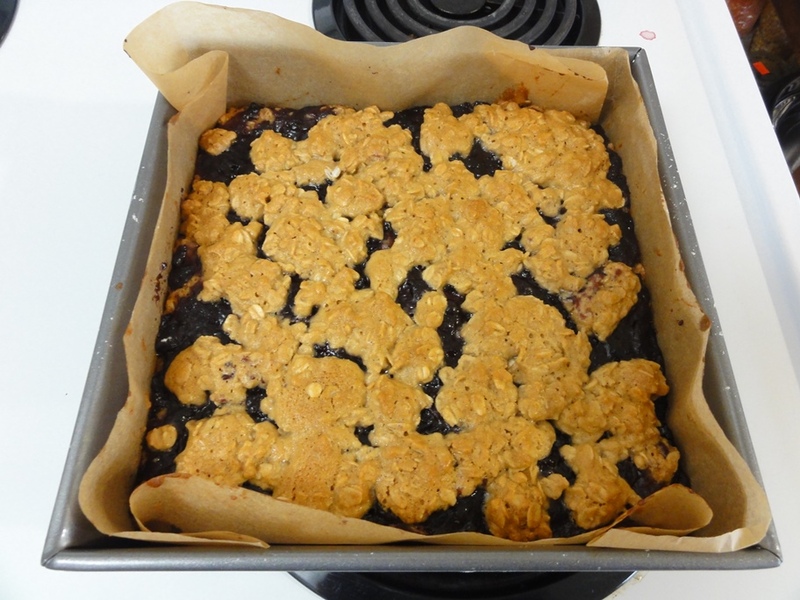 The blueberry spread I used here was a jar of predominantly blueberries and sweetened/preserved only in fruit juice. Another way to go at the filling would be to make your own fruit spread from scratch by stewing fresh or frozen fruit of your choice; then the degree of sweetness would be entirely up to you! 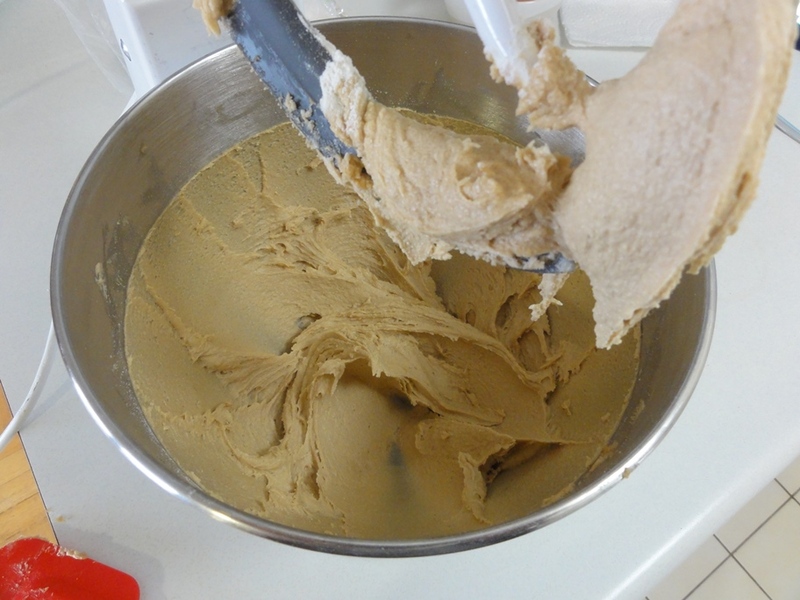 The original recipe called for 1/2 cup of all-purpose flour and 1/2 cup of whole wheat flour. Given the combination of flours that make up my all-purpose gluten-free flour and my lack of anything resembling an equivalent to whole wheat flour, I just went with the equivalent to a cup of all-purpose. If you’re making these with wheat flour and have both all-purpose and whole varieties on hand, it can’t hurt to stick to the original plan. A quarter cup of honey is a beautiful thing. The dough will be fairly moist at this point but you’ll change that in a minute. 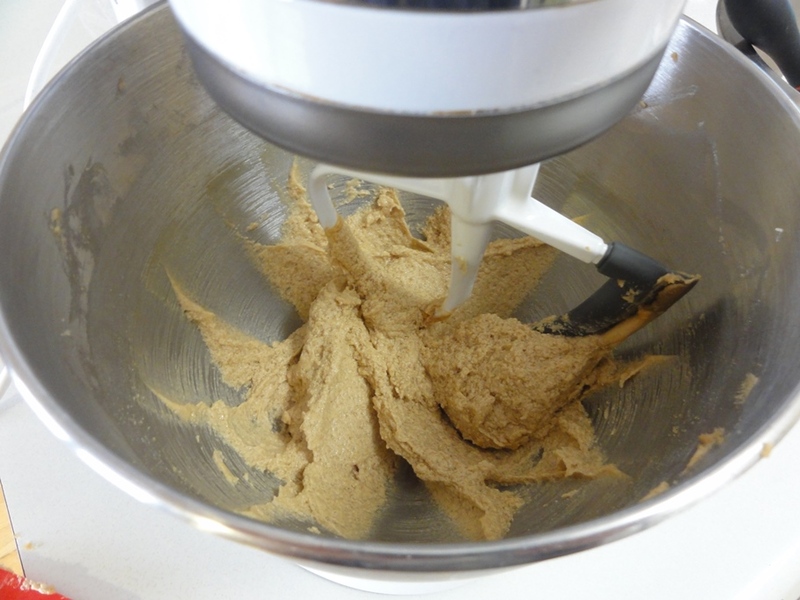 I separated the dry ingredients into two steps here compared to the original recipe’s directions mostly on the grounds of my usual preference for mixing flour and the small quantities of dry ingredients together first before adding them to the wet. 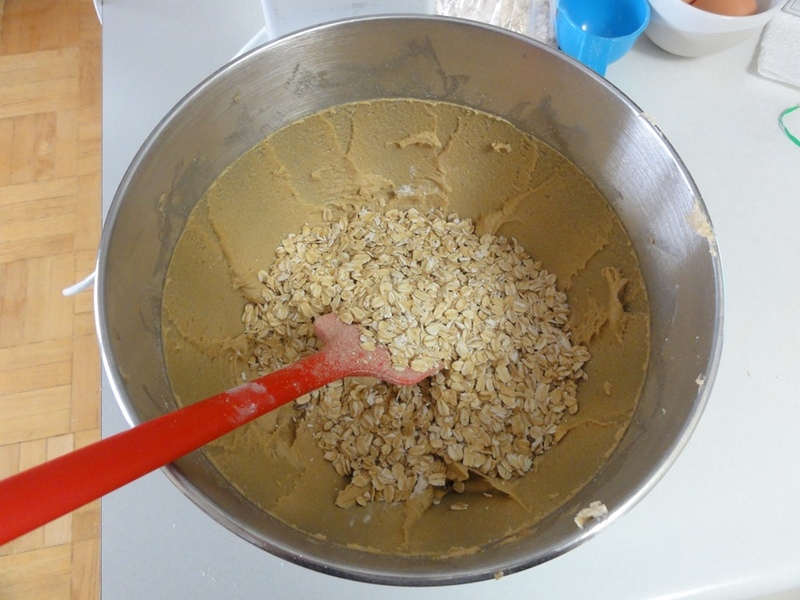 So first whisk together the powders and then the oats will come in last. After adding the flour the dough will firm up and get sticky. Then finally we fold in the oats. Getting to this next step is messy. Dusting your hands in flour is a good start but only got me so far because the dough is very sticky, I expect due in a big part to all the honey. Once I got most of the way to an even layer I switched to a spatula that I repeatedly swept clean with the flat edge of a butter knife; that got me the rest of the way there. The jam was considerably easier to spread. I may have used a little more than 3/4 of the dough for the bottom layer because there wasn’t much left over to crumble on top. It does spread out though so don’t be too concerned if your top looks to be lacking. Also, don’t try spreading the remaining dough on top with a spatula because the jam will stick to it right away and you’ll get a swirly, oatmeal and jam mess. Once baked up the top spreads out a little more evenly. Great idea putting them in little muffin liners! Makes it much easier to share!